Five minutes earlier, I had been sleepily reading a magazine in the waiting room. It was 1969, the tail end of the good old days when expectant fathers got the boy/girl news after the fact. The waiting process was a mix of anxiety and excitement, boredom and butterflies, and idyllic thoughts of the future. Suddenly, all of that was interrupted by the harsh reality of survival. The pregnancy had been difficult. My wife’s water broke in January–five months before the due date. If there was to be any chance of a successful birth, she would need to be virtually bedridden until the delivery, doing as little as possible to disturb the baby’s tenuous lifeline. She managed to hold on until late March, so the doctor’s pre-delivery optimism for a 5-pounder seemed well founded. That’s where my head was when I heard “two tiny baby girls” and “survive”. I was 22 years old and had been married just seven months, the last few of which having been spent as an in-home caregiver by night and something-less-than-an-entry-level Madison Avenue ad man by day. Suddenly, I found myself driving a little too fast down life’s road of emotional milestones—marriage, career, impending fatherhood, crisis, birth…and 72 hours later, death. “The little one passed this morning.” It was the pediatrician talking to me this time, as I stood in a phone booth at the Park-and-Ride lot on the New Jersey side of the Lincoln Tunnel. It had been three days since the births; mother and babies were being well cared for in the hospital and I was on my way to work. This was my usual early morning call to the doctor. “Your wife doesn’t know. I thought you should tell her,” he patiently intoned. My stomach hurt. My heart hurt more. I got back in my car and drove to the hospital, amid tears, and memories of the night before. As I had taken my last look at the babies that previous night, in their incubators, connected to feeding tubes, hands bound in gauze mittens at the end of their scrawny little arms, the little one (younger by a minute) kicked up her legs like she was auditioning for A Chorus Line. It gave me an amazing sense of optimism for her chances. “She’s raring to go,” the nurse had said through the thick glass that isolated the at-risk babies in Intensive Pediatric Care. I nodded my agreement and waved good-bye for the night, as the curtain closed behind the observation window. Now I was back. It was 8:15 in the morning. Early spring sunlight filtered onto the hospital’s freshly waxed floors. There was a quiet peacefulness to the place as I waited for the curtain to be reopened. 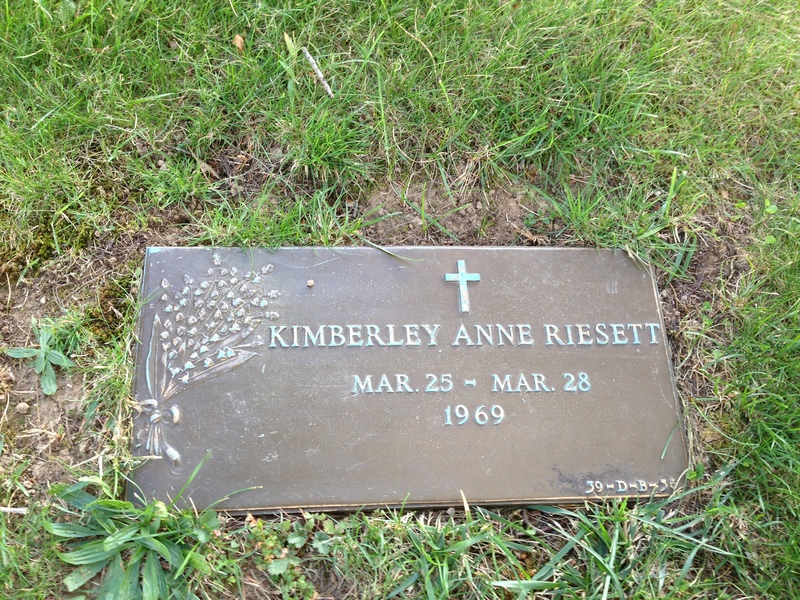 I wanted to see my surviving daughter, Christine, before I told my wife what had happened to Kimberley. I could hear the nurses talking on the other side of the glass. I needed to believe that Christine would make it. I needed to, somehow, through the thick glass and the incubator and the feeding tubes, will her to make it. I watched her breathe, the helpless breath of a newborn kitten, and for a precious few moments, I breathed with her. Then I looked at the empty incubator beside her, and I spoke to God. I knew that He already had Kimberley in His good hands. I wanted Him to tell her that she would always be in my heart. Life is never more precious than when it is taken away from us. Yet, somehow, we carry on, even as we occasionally glance backward. 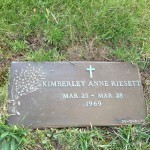 I have visited Kimberley’s grave many times since that March day in 1969. Sometimes with family, often alone, one special time with my then three-year old grandson, Nicholas, in my arms. Christine’s son. It was very cold that morning. It’s always cold on that hill.